...wanting perspective on owners who have a high mileage xc60 from this year set to see if I should take the plunge.. If you need reliability and cheaper repair costs don't buy the Volvo. That example with 128k miles is probably near the end of its life. Get a Lexus RX 350 and drive it to 250k miles. 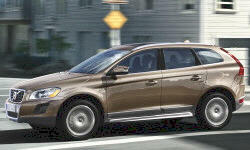 The 2013 or newer Acura RDX is also reliable. There is a potentially catastrophic oil loss problem (bad piston rings) with that vehicle do some research on the problem (and others) before you buy. I had one I really liked but ended up not buying due to the oil issue.